The 2013 Sheepherder's Party was a fun party with lots of entertaining people in attendance. I was feeling a little under the weather, so I didn't get to attend as may events as I wanted, but I did go both evenings. The open mike program is a favorite, and this year proved to match up to my expectations, with fun stories, well-crafted poems, and plenty of jokes. I didn't keep notes of all the speakers, but I did get photos of them. Reporter Dean Draper from the Millard County Chronicle was there taking notes. He told me that this event was the big news for the county that day. Below are the photos of the speakers/entertainers. Sourdough Slim provided some great entertainment. He also had additional performances Friday afternoon for the school kids and Saturday afternoon. This was the tenth year of the Sheepherder's Party. It sure livens up a cold January! An article about Lehman Cave made the front page of the Las Vegas Review-Journal on Sunday. Nice job, Henry Brean! Ready for some fun? 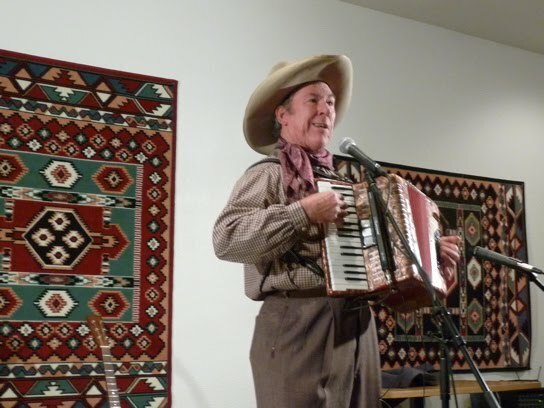 Sourdough Slim is back to entertain Snake Valley for the annual Sheepherders Party. He was here in 2009 and 2010 and we're so glad he's back! He sings, tells jokes, plays various instruments, and is just so much fun to watch. He'll be at Baker Hall Friday, January 18 at 10:30/11:30 am (NV/UT) and at the Border Inn Saturday, January 19 at 2:30/3:30 pm (NV/UT). Come join the fun, and be sure to check out some of the other events. For more info, call the Border Inn at 775-234-7300. 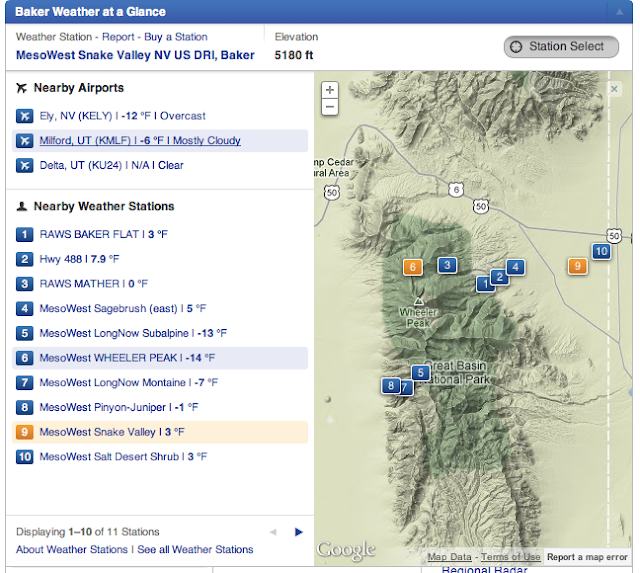 Want to know what the weather is in the valley? Sure! Weather is something we all check regularly. However, with over 8,000 feet elevation difference from the valley bottom to the mountain tops, we don't just have one weather, we have many different weather conditions in different microhabitats. If you go to the middle of the page, you can click on the grey "Station Select" button. This gives you an image of the local stations (like the one above, although I zoomed in a bit to get the image you see). From the list on the left, you can see the current temperature at each station. This morning, it's -14 degrees up at the Wheeler Peak campground (station 6) and 3 degrees F near the Border Inn (station 10). If you click on the station, you can get the forecast for that site. And it sure can vary a lot--the Border Inn is not expected to get above freezing and will be under an inversion midweek. Meanwhile, the Wheeler Peak campground will get above freezing and have clear skies. It's fun to play around with this site. It's not perfect: if you do a search for EskDale, UT, you end up seeing a map for EskDale, WV. Nevertheless, it's the best weather compilation I've seen so far, and I've bookmarked it on my computer. Not sure where you are on one of the many roads in North Snake Valley? Not to worry, this sturdily-constructed sign will tell you the distance and direction to many points. The sign, and the rather short distances (all less than 50 miles) make it seem like it's a fairly-well populated place. This is what most of it looks like, though! Fish Springs National Wildlife Refuge is located in the middle of nowhere. More or less. In the winter it feels especially isolated, with little traffic on the roads, and the knowledge that if you break down, you're going to be on your own for awhile. Although many people might not visit Fish Springs in the winter, it's many birds do visit, and quite a few stay. Warm springs and plentiful food provide an important wintering area for many species. To find out just how many species, the refuge holds an annual Christmas Bird Count. This year it was on Saturday, January 5. The day started below 0 degrees Fahrenheit. The cold probably scared off some potential counters, and only five people participated in the count. After receiving our assignments, we headed off to different parts of the refuge to see what might be out in the cold. Inversions have caused the trees to frost over, but that didn't stop a couple golden eagles from perching on them. Later we saw a rough-legged hawk here at Thomas' Ranch, and other folks saw a bald eagle. The cold extended right down to the water's edge, but the springheads were still pumping out water. Steam rose from many of the springs, giving the area an otherworldly look. We had an excellent view of these Virginia rails, and we saw five in our count area alone. Other highlights were short-eared owls, one ring-billed gull, many northern harriers, lots of pied-billed grebes, and five great blue herons. Other counters saw swans and lots of ducks. In the afternoon, the refuge conducted the mid-winter waterfowl count. I personally only saw about 500 birds, but in total over 3,000 were counted. Wow! Fish Springs is such an amazing place, and it was a real treat to see what it was like in winter. Volunteers can stay in the bunkhouse, a very nice, warm home away from home. I'd highly recommend visiting--and if you like birds, volunteering for next year's Christmas Bird Count!